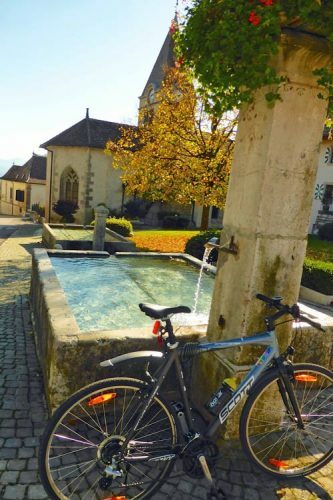 Boking around Lac Léman is easy on cycling route 46 that guides cyclist around Lake Geneva in Switzerland and France. The route is relatively flat but offer fantastic views of not only the lake but also the Alps and Jura mountains. Cycling route 46 guides cyclists on the 200-km Tour du Léman bike tour around Lake Geneva (Lac Léman) in Switzerland and France. The route is suitable for most cyclists and families as it generally follows quiet country and agricultural roads with only gentle inclines. It is also easy to adapt the route for better views or by using Swiss trains or lake boats part of the way. Heading up the vineyard covered slopes of La Côte or the Lavaux region may be more challenging but will ultimately be very rewarding too. 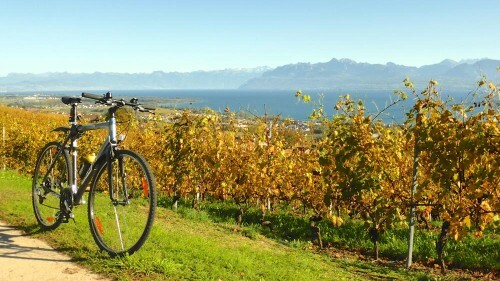 Riding a bike around Lake Geneva is the dream of many residents and visitors to the Lac Léman region of Switzerland and France. This challenge has always been possible using a combination of public roads and cycling routes. However, from mid-2015, the dedicated regional cycling route 46 Tour du Léman actually guides cyclists on relatively safe and quiet roads around the lake. The total route is just less than 200 km but Switzerland’s excellent rail network makes it relatively easy to break up the ride into different stages. The route around Lake Geneva is marked as Route du Léman. In Switzerland, the marking is on the typical red cycling route signs with the number 46 in white on a blue square. 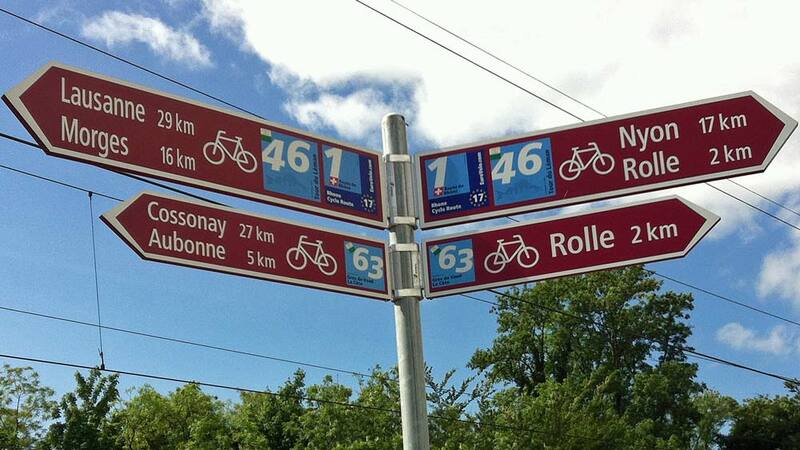 In France, the green-and-white bike route signs are used with Tour du Léman on a blue square. Although the route can be done in any direction, cycling around the lake clockwise will always keep the cyclists closest to Lake Geneva. The new Tour du Léman cycling route is marked in Switzerland as regional cycling route 46. The cantonal flag of Geneva, Vaud, or Wallis in the corner of the signs shows cyclists in which canton they are cycling at any given moment. Route 46 often shares the pavement with other cycling routes, especially Route 1 – Route du Rhône – that is a European cycling route following the flow of the Rhone River down the Valais valley, through Lake Geneva, and then through southern France to the mouth of the river in the Mediterranean Sea. Route 46 uses mostly dedicated cycling tracks in cities and major towns but once in the countryside, the cycling is mostly on quiet country roads or, even more pleasant, on paved routes used for agricultural activities. However, if cycling with children, note that there are a few short stretches that are on positively dangerously busy and narrow roads. Route 46 is relatively flat with only minor inclines when needing to pass especially railway lines or the Autoroute. It is a steep climb to Chexbres in the Lavaux – many may prefer to stick to the busier lakeside road but will miss out on some fantastic views. The marked route rarely uses the shortest road – the busy Route Suisse, or N1 – that runs near the shore of Lake Geneva for most of the way from Geneva to Lausanne. Cyclists may also easily adapt the route a bit and enjoy better views from higher up. For example, in the La Côte region – follow any of the bridges across the autoroute after Gland and take the fairly gentle climbs through Gilly and Tartegnin to Mont-sur-Rolle. From here, cyclists can enjoy magnificent views from high without any further climbs all the way to Aubonne. In the Lavaux, the views are even better but the climbs generally much steeper. 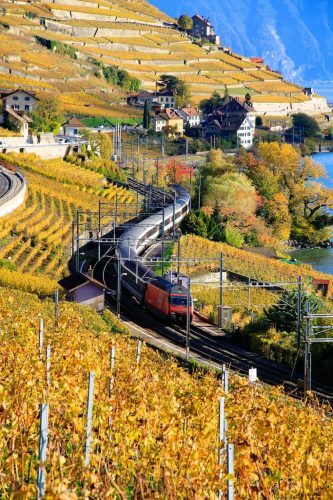 It is easy to cut short a ride, or to divide the route into stages, as it is rarely more than 15 km of cycling between train stations with at least half-hourly trains to Geneva and Lausanne. Bicycles may be transported on most regional trains and postal buses in the Lake Geneva region but requires a velo ticket – around CHF12 to CHF18 per day. Most of the southern shore of Lake Geneva is in the French region of Haute Savoie (Upper Savoy). Here, the cycling way is marked as Route du Léman and often follows the shore of Lac Léman closely. Between Evian and the Swiss border, the cycling is on the main road. Public transportation is less developed on the south side of Lake Geneva than in the north making it somewhat more difficult to spontaneously adjust the route. However, bicycles may be taken for free on the regional trains from Évian and Thonon to Geneva and on bus 131 (limited spaces) between St Gingolph and Evian / Thonon. 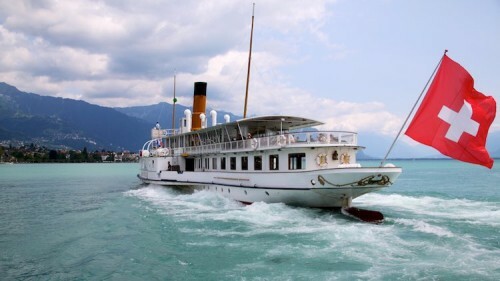 Often, it is easier to use a passenger boat on Lake Geneva to a next port. The year-round ferries between Evian and Lausanne and Yvoire and Nyon are particularly useful to link back to the Swiss railway system. A day ticket for taking a bicycle on the boats is around CHF8. See Le Tour du Léman à Velo for more information and a free pdf map. It also has links to bicycle rental shops – usually a bike rented at Geneva station may be dropped off at Lausanne and v.v. Free bikes are often available for up to four hours in Geneva in the Genève Roule! scheme.